THE CHALLENGES, JOY, AND LESSONS OF DAILY PHOTOGRAPHY SHOOTING. Daily photography shooting or “daily shooting” as it’s usually called. Can be an interesting experience. The concept of it is very simple. An individual who goes to different locations and takes photographs of what they see, and does so on a daily basis. Granted one might think that if you don’t have career in photography you may not get to photograph items every day. And actually that is not always the case. One could take photos during their lunch break at work, or even after work. Even traveling to and from work one could take photos. Besides how many of you take out your smart phone and snap a quick picture of something that caught your attention while traveling to work, or going home from work? We all have done this at one point in out lives. Not every day, but we all have done this. It’s pretty much the same concept. Expect that instead of a smart phone, you will be using a camera. Could be a small “point and shoot.” Or even with a “DSLR” if you have one and are willing to travel with it on a daily basis. At the start of the month (August, 2013) I came across an article on a photography websites blog that I follow that talked about daily shooting. After reading what I thought was a very good article/blog post. I thought to give daily shooting a try. I can actually say that daily shooting is a great practice to do if you are into photography as a hobby, beginner or otherwise. I had my personal reasons for trying daily shooting. But my biggest reason for doing so was to improve my photography. Yes… even a seasoned photographer such as myself can learn new things from daily photography, and not just beginners too. Plus my other reason to a much lesser extent is the fact that I enjoy exploring new places. So for myself putting photography and exploring together was a perfect combination and reason to try daily shooting. During my four weeks of daily shooting I have discovered three things that I will explain. First is the “challenge” of daily shooting. The second is the “joy” of daily shooting. And the third is the “lessons” I have learned from it. Shooting daily I found when I first started it was challenging to me, for I found myself planning and trying to get creative on what should be just a simple walk around different parts of town just taking photographs. Granted I am a perfectionist when it comes to my photography. I just had to remember that during my travels around town that not to search for something in particular to photograph, but instead to photograph some random item or event that I found interesting at that moment during my travels. In layman’s terms, I was just going to do basic and simple “Street Photography.” Street Photography is a genre of photography that features subjects in candid situations within public places. Street photography simply refers to a place where human activity can be seen, a place to observe and capture social interaction. Basically I was going to stand at a location and watch the world and people go by and photograph it. And by doing so I have kept the process of photographing very simple while not having to worry about planning what to photograph. Shooting daily isn’t hard it actually gets easier with time I had discovered. Especially when you keep the subject that you want to photograph simple. Like I said before stand at a location and watch the world and people go by and photograph it. That worked best for me. Another challenge is taking the time to photograph. What I started to do was just take my photography gear with me and just go out for a daily walk and randomly start shooting items of interest while during my travels. What started out as short walks around the neighborhood, became longer walks venturing into other neighborhoods. But by walking into other neighborhoods I found different, and new things to photograph. As well I was getting out of my comfort zone by exploring different areas that I was not familiar with. The next challenge was bringing my camera and gear with me. Most of the great shots that you will take aren’t planned or set up, they just happen right in front of you without warning or notice. As well I have discovered that the less gear you take with you, the better the outing will go. For you don’t have to worry about how much gear you will need if you just take the minimal items. I started what I called a “Daily Shooting Kit.” The kit is simply is a small Lowepro Adventura 170 camera bag. That has for me the basics of what I need for daily photography, my Canon 600D camera body and the following lenses. The lenses listed above each have the following focal lengths. As you can see I cover a range of 18mm-200mm. The primary lens that I use for daily shooting currently is my Canon EF 28–90mm lens f/4-5.6 III for it has focal lengths of 28, 35, 50, 70, 90mm. You may have noticed that within that series for focal lengths is 35, 50 and 70mm. So basically it’s a 35-70mm lens with what I call “gives me an edge.” Meaning if I need to go lower than 35mm or higher than 70mm, I can do so without having to switch lenses. And that saves time when trying to take a quick photo of street activity. As will it’s a wide-angle lens so it allows me to get more of my subject and background of what I am photographing. My Canon EF-S 18–55mm lens is as well a wide-angle lens. I use the Canon EF 80–200mm lens is not a wide-angle lens, I use this lens if I want to get a close, tight shot. If you are wondering why I carry two 50mm fixed lenses it’s for the following reasons. First my EF 50mm f/2.5 Compact Macro is great for macro photography. If I discover something small to photograph during my travels I would use this lens. My Canon EF 50mm f/1.8 II lens is great for low light photography once the sun goes down and I am still out and about taking photos. I would also have an assortment of filters, and other odds and ends such as spare batteries, cleaning cloths, spare SD memory card, lens caps and an air blower as well. Just the bare minimum is what I take. And using a small but functional camera bag will force you to not travel with excessive items. The joy that I get from daily shooting is the fact that I get to explore and photograph what I find to be many interesting things, places and most importantly people. One day while I was shooting an area that was under construction on a local street. I was approached rapidly by three young males all trendy dressed individuals. Wanting me to take a photo of them. After a quick moment of stun and awe I proceeded to do so and took a photo of them. Once it was taken they just walked away and continued on their journey. And they never even asked me to send them a copy of the photo. A concerned construction worker approached me and asked. “Does that happen a lot?” My reply was “Yes it does happen. Not often but it does. Shocks me every time.” For the record the photo did not come out not that well; for it was severely overexposed for the camera was on a different setting from a pervious photo that I was taking before hand. I literally had no time to make the necessary adjustments for that spontaneous shot to be taken. Let’s just say it was a “lesson learned.” And that lesson is to be somewhat prepared for an unexpected moment to photograph. But most importantly for myself is the fact that it was a fun and enjoyable moment. Below are a few photographic examples of my daily photography. 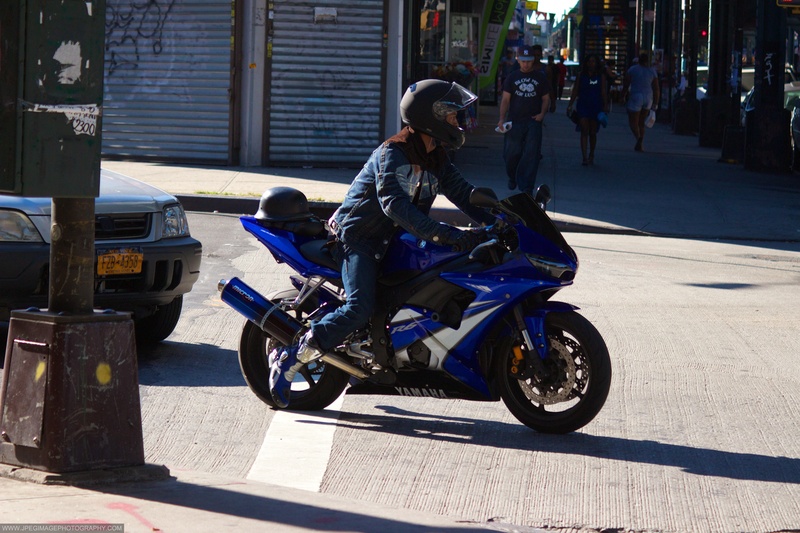 Person on Yamaha motorcycle crossing a Brooklyn street across Broadway. 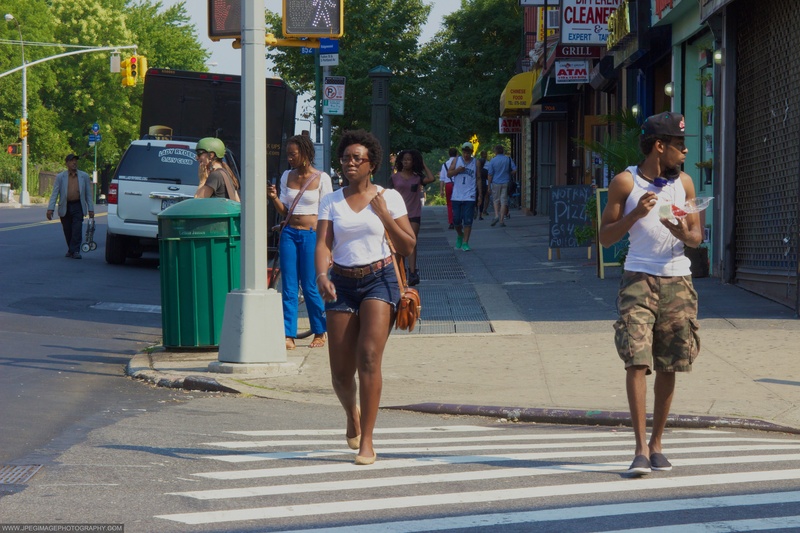 Two people walking down Fulton Street and South Portland Avenue in Fort Greene Brooklyn, New York City. 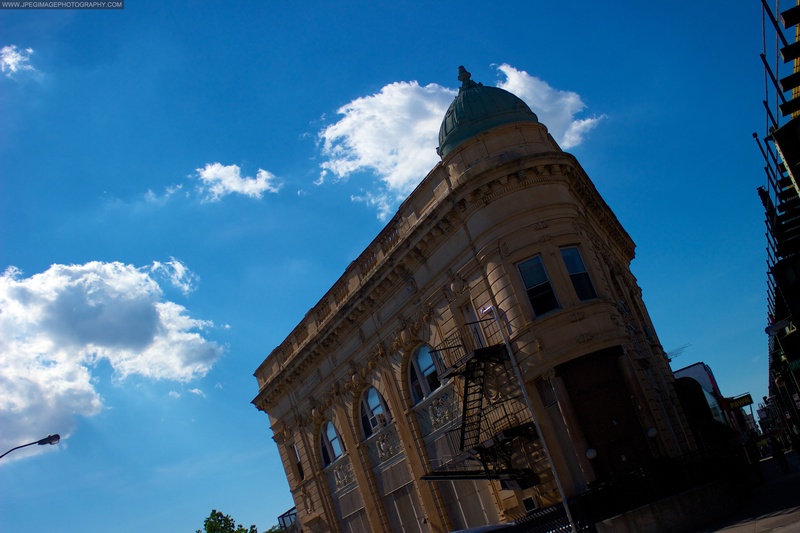 Building on the corner of Greene Avenue and Broadway in Bedford-Stuyvesant Brooklyn, New York. Attempting daily photography one discovers a few things. Such as your photography does improve. I do photography regularly, but I did notice an improvement in my photography work when I took the time to experiment and practice more of what I felt what I needed to improve on. As I stated previously in this post is the fact that I am a perfectionist when it comes to my photography and even a seasoned photographer such as myself can learn new things from daily photography, it’s not just beginners too. You will also discover that daily photography is not hard at all. You just have to be willing to commit to it. Granted if you can’t do it every day that is fine, just try even once or twice a week if you can for starters. If you enjoy it you will make the time to do more. Try to photograph something different every day. For example take one day to photograph people, the next day photograph buildings. The day after that try standing or walking down a major street or go into a local park and photograph the activity that goes on. You will find out learn quickly that you can get some great shots from people’s activity. Experiment with your photography and your personal style. One day just use one lens and see how many photos you can take. The next try a different lens, or you could do what I did on some days. And that was start off using one lens. I would start off using my Canon EF 28–90mm lens for about an hour, then switch to my Canon EF-S 18–55mm lens and just shoot with that lens for an hour and so on. Even take the time to switch your lens filters too, you will notice a difference in your photos. At times I would start with an ultraviolet-coated (UVC) filter. Then switch to a neutral density filter (ND) you will discover a difference in your photos. Another lesson that I have learned is that if you pack light when you travel, you don’t use all your energy lugging gear around. Pack light and just take what you need the minimal that way you don’t get tired early. And that will even help you to travel or walk (like I did) longer distances. But the most important thing that I had leaned is this. Just have fun with it, go explore new and different places and neighborhoods. You never know what you could discover in your travels.